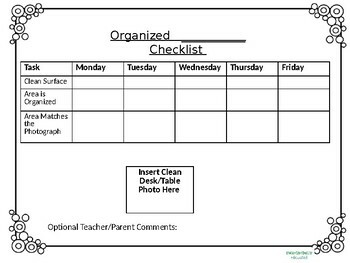 These is a resource that will hopefully help those students who are not as organized or focused. Students who are ADD, ADHD or lack ability to stay focused might benefit from these resources. -Organized Table, Desk, Toolbox Checklists. (For those who don't' have traditional desk or toolbox.) There is a blank one so that it can be personalized. It is not editable but you may message me for editable version. The font may change if it is emailed. 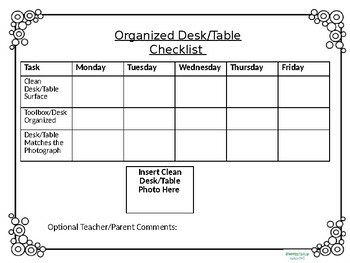 There is a spot for photo of an organized work area to personalize students checklist. 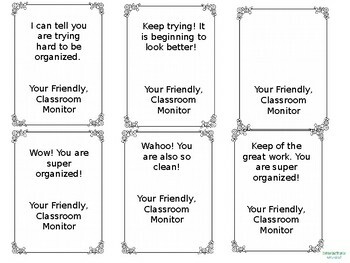 -Tickets for Classroom Monitor job- A student may pass out positive and kind tickets to students working hard to keep organized. I might suggest letting the student who is struggling lead this job with an organized friend. 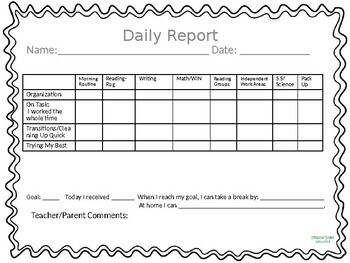 -Daily Report- Blank and example of report that can go home to parents. May or may not include reward or consequence. I personally do not use rewards in my classroom, but some students, specifically with ADD/ ADHD often need simple rewards or breaks in order to stay focused and complete tasks. -Sample and blank morning and pack-up routines. Thank you @ateacherscreativespace for the font! Thanks to Creative Clips for the border! Check out her TPT and instagram account for fun fonts.- Thanks Sabrina. Check out Creative Clips Clipart by Krista Wallden, a link to her TpT store: http://www.teacherspayteachers.com/Store/Krista-Wallden . Thanks for the borders!